It’s a huge misconception that you have to start decluttering/downsizing RIGHT NOW to live more intentionally TOMORROW. This is not true. I REPEAT: THIS IS NOT TRUE. I started practicing intentional living when I started homesteading three years ago. At first, I didn’t even realize it. Homesteading sort of forces an intentional lifestyle on you (and it’s wonderful). Almost two years ago, though, I really started to try. My husband and I had just returned from a two-week honeymoon in Canada with no phone and internet. Long story short, I realized I was missing out on so much beauty. I’m putting this one first because it’s been my favorite part of starting to live more intentionally. Breathing is also the most accessible way to starting living intentionally because you’re already doing it! Since you’re alive and breathing, let’s take it one step further. Set down your phone, or your mouse, or whatever you’re using to read this article. Close your eyes and breathe. Pay attention to your breath. How far in are you breathing? How far out? Play with different lengths of breath, counting to 5 in and 5 out maybe. You’ll be amazed at how simply paying attention to your breathing a few times a day will help you live more intentionally. Every day now I stop a few times, close my eyes, and just breath. Think of it as a way of checking in with yourself! Put down that phone! It’s no surprise we live in the age of technology. If this is a surprise to you, it’s safe to say you’re probably living VERY intentionally and I’m not quite sure why you’re still reading (but thanks anyway!). FOMO is a real thing and it stands for “Fear Of Missing Out”. You aren’t going to miss out by unplugging for an hour. Sort through your apps on your phone and delete the ones you don’t use. Once a week every month, delete your social media apps and limit yourself to laptop/computer access only. Unplugging is a great step towards intentional living. Observe. This is my second favorite after breathing and also something I didn’t do before homesteading. Now that I’ve been actively practicing intentional living for a couple years, I realize how much I’ve missed out on. I can imagine the breathtaking sunsets I missed or wildlife I didn’t see while riding through the mountains, checking my phone for service. When you stop and take a minute to look around, you’ll be pleasantly surprised at what you see. You’ll start noticing birds, different types of trees, the bugs on the ground while walking through the grass. This troubled world holds so much glory and beauty waiting for you to notice it. Have you observed your surroundings? Good! Now let’s acknowledge them. The definition of Observe is “notice or perceive (something) and register it as being significant.”. Acknowledge’s definition is “accept or admit the existence or truth of.”. Why does this matter? Well, my theory is if you learn to observe and acknowledge the beauty around you it’ll be easier to observe and acknowledge the opposite. Part of intentional living, for me, is to be present at and in the moment. For example, I’ve become better able to process my emotions and react appropriately to quick, stressful situations. Start with turning off your phone and putting it in your pocket. Unplug for five minutes. Minute 3 & 4: Observe your surroundings. Do you hear the trees’ leaves rustling? The wind blowing? Maybe you’re inside and hear the air conditioning unit humming. Make a mental note. Minute 5: For this last minute, just acknowledge what you’ve observed. Keep your eyes closed, your phone off, and thank the trees for dancing in the wind (maybe mimic them later and do it yourself). Maybe you’re having a terrible day and, through checking in while breathing, you realized you need to be kinder to yourself. Acknowledge that you slowed down. You were present. We shouldn’t keep all of this to ourselves! Share your process. Someone around you might also be wondering how to live more intentionally and you could guide them through it. In my opinion, sharing is quite similar to acknowledging after you’ve observed. Putting actions into words sometimes makes things so final or complete. I know the saying is “Actions speak louder than words”, but in this case, I think they go hand in hand. Right now, I’m sitting at my dining room table listening to a bird outside the sliding glass door. My dining room table looks into our small kitchen, with only a countertop separating the two spaces. The glass door is to my immediate right. I hear my fridge humming and my dog, Hank, is laying at my feet; he just let out a big sigh. My husband just left for work and the house is still and quiet, although also not quiet at all. It’s still dark outside and another bird just started calling. It’s a beautiful Monday morning, friends. My second-to-last suggestion while learning to live more intentionally today is to write it down. It can be someting simple like a notebook or, in you’re artistic, a bullet journal like this simple one. Writing down your observations and/or feelings gives them a platform to be. For me, writing is a way of reflecting on myself and has strongly aided in the growth of my self-awareness. I recently found a journal from high school I used to write in when I traveled a bit. There were three occasions when I wrote while traveling. First, a trip to New York for a fiddle camp, then a trip to California to visit my sister after I graduated high school, and a trip to Europe with a bluegrass band I was in. It was so eye-opening to read something from 6-7 years ago. It made me love the person I am now much more! Last up on the list of ways to live more intentionally starting right now where ever you are is to practice stillness. This one used to be very hard for me. I’m not going to sit here and tell you that I meditate, or even enjoy meditating. I love doing yoga, but I don’t do it often enough. Sometimes, I try to throw in a minute of “meditation time” after I’ve done yoga, but it’s a rare occurrence. What I do often, though, is practice stillness in a way that isn’t meditation. You can do this ANYWHERE no matter what time of the day it is. Just stop and be still. For me, I practice stillness for a moment every single night while I’m closing all of my farm animals into their homes for the night. Sometimes I’ll stop, close my eyes, and then open them to look up at the dark sky and breathe deep. Other times I just stop, look around and breathe. It’s interesting to observe the world around you once the light has fallen and the night has settled in. I’m no intentional living guru or life coach. I haven’t been trained in the field, so I’m only speaking from personal experience. Living intentionally brings, and has brought, so much joy to my life. That’s not to say I live intentionally 100% of the seconds in a day, but I try. Sometimes I become frantic and I rush, leading myself to stumble over my own feet or drop things. That’s my number one cue that I need to slow down. Then, I use that 5-minute exercise I provided you with above to breathe, unplug, observe, and acknowledge my actions and my day thus far. A large part of my journey as been learning to check-in with myself more often. 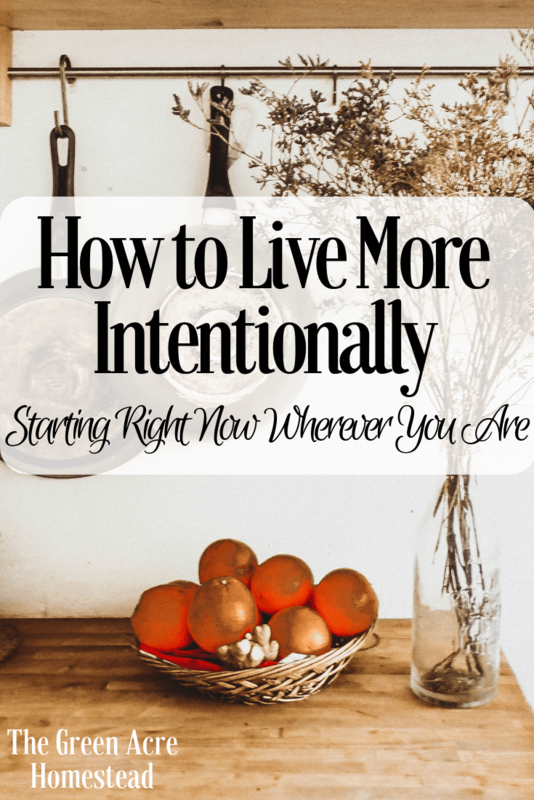 Are you practicing intentional living or have any questions? I’d love to hear about them below! And that is exactly what homesteading is all about. Intention! Appreciating the things that most take for granted. Seeing the beauty in the world! I deliberately placed my desk at a window so I can hear the birds chirping and the frogs croaking at the lake! Great post-Chelsea! You hit the nail on the head girl! Yes! I’ve been wanting to set up an office space for myself but my dining room table is surrounded for two windows and a sliding glass door and I LOVE hearing everything that goes on outside. Thank you, Annie! That means a lot coming from you! Thank you for this post and I agree with it completely! Thank you for sharing! Thank you for stopping by and sharing your kind words with me! This is a wonderful primer on mindfulness- the very reason we deduced to move to our little homestead. So many people walk through life asleep that those who are awake are in a constant state of amazement. WT, thank you so much. I agree with everything you said. This life has provided me with the tools to “wake up” and I’m so thankful for it. It’s wonderful you’ve found the same, too. I can’t wait to have children and watch them grow up surrounded by this beauty!